ER visits tied to marijuana edibles were 33 times higher than expected, prompting new warnings from national health experts. ER visits tied to marijuana have risen dramatically in Colorado since legalization and people using edibles suffered toxic reactions – including cardiac and psychiatric problems – at much higher rates than those smoking marijuana, according to a groundbreaking new study from researchers at the University of Colorado School of Medicine. ER visits tied to marijuana have risen dramatically in Colorado. Public health experts are sounding the alarm over toxic reactions, especially with edible marijuana. Photo: Getty Images. The study was published today in the Annals of Internal Medicine. The findings mark the first time that researchers have shown an increased rate of adverse events tied to marijuana edibles. Dr. Andrew Monte, an emergency medicine and toxicology specialist at UCHealth University of Colorado Hospital, is the lead author. He studied ER visits between 2012 and 2016. 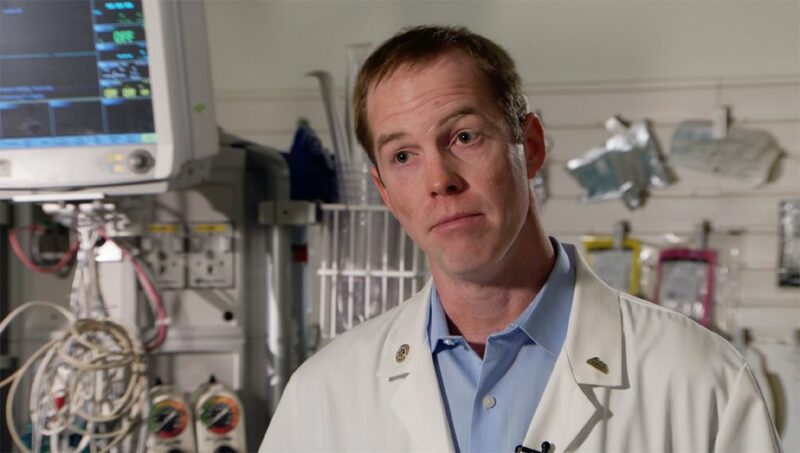 Monte is also an associate professor at the University of Colorado School of Medicine on the Anschutz Medical Campus. Colorado legalized medical marijuana shops in 2009 and recreational marijuana in 2014. Nearly 10,000 emergency visits during the study period were tied to patients who were smoking marijuana or ingesting edibles, according to billing codes for the visits. Doctors determined that more than 25 percent of these patients were coping with medical symptoms related to their marijuana use. Researchers found a three-fold increase in marijuana-related ER visits between 2012 and 2016. Visits due to edibles were 33 times higher than expected, when controlled for product sales in the state. Overall, more users sought help after smoking marijuana. They often suffered from nausea and vomiting — a condition known as cannabinoid hyperemesis. Only about 11 percent of the ER visits tied to marijuana were linked to edibles. But, sales of edibles represent a much smaller share of Colorado’s marijuana market. Therefore, a disproportionate number of patients using edibles seemed to suffer toxic side effects. Cannabis is now recognized as a risk factor for adverse cardiovascular events. Users reported more long-lasting effects from edibles compared to smoking or vaping. Sometimes they reported unpleasant psychiatric symptoms. Deaths tied to cannabis consumption are rare, though the only confirmed deaths associated with marijuana have involved edible products. One young man jumped from a balcony. Another man killed his wife and claimed that an overdose of edibles caused him to act out violently. Another young man died by suicide at a Colorado ski resort after ingesting high doses of edibles. Tourists visiting Colorado, who don’t have a history of using marijuana edibles, should be especially cautious. Is marijuana safe for older adults? The study findings prompted leaders at the National Institute on Drug Abuse and the National Institutes of Health to alert health experts to the results. “Monte and colleagues’ findings have important clinical and public health implications,” Dr. Nora D. Volkow and Ruben Baler wrote in an editorial that accompanied the study. Volkow and Baler warned that marijuana edibles may not be properly labeled or users may eat too much of a product if they don’t feel high right away. Given the expanding legalization of marijuana across the U.S., the public health experts called for greater oversight of manufacturing, labeling and quality control of marijuana products. The study found that marijuana users who sought help were generally younger and more often male than the average ER patient. Women, however, comprise more of the users who consumed edibles. And many come from outside Colorado, suggesting that they aren’t regular users. Dr. Andrew Monte is the lead researcher on a groundbreaking new study that highlights dangers of marijuana use, especially edibles. Photo by UCHealth. Monte said it’s common for visitors to finish the products they’ve bought just before leaving town. “Then, just when they get on the airplane they go crazy,” he said. While Monte understands that some people are using edibles for medical purposes, he urged caution to those consuming large doses to get high. “There’s a much higher risk with taking edible agents,” he said. “It’s so unpredictable in terms of the effects. The nausea associated with marijuana use more commonly afflicts regular weed users who smoke several times a day. “In high doses, some people end up with a cyclic vomiting syndrome,” Monte said. Users need to be very cautious with edibles, Monte said. “For medical purposes, start low and go slow,” he said. “Second, don’t mix marijuana with other drugs like alcohol or other sedatives. This can exacerbate the symptoms. We don’t know how much and to what degree. But, avoid mixing cannabis with other psychoactive substances. “From a medical standpoint, people need to consider this like any other pharmaceutical they take. All drugs have the potential for adverse events,” Monte said.